You all know that, unfortunately, at the Hostile Takeover 2012 Tour stop on 6/16 in Sayreville, NJ at the Starland Ballroom, circumstances beyond our control made it impossible for Tech to perform. Tech was in full performance gear and ready to go on stage, but wasn’t able to. As many of you know, shortly before Tech was to take the stage, a driver ran into a light pole. This blew out a transformer and the building’s power was completely knocked out. We know this was disappointing to all of the fans who waited to see Tech, which is why we’ve scheduled a make-up performance* for Thursday, July 12! Hold on to your original ticket stubs or contact the box office (www.starlandballroom.com) for more information on admission to this show. 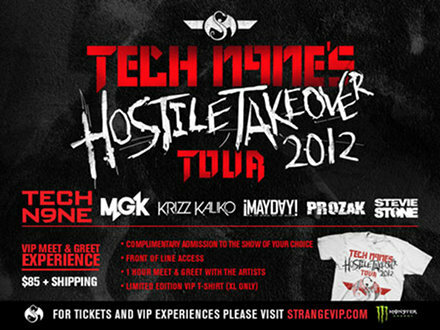 If you purchased a VIP package for the original Sayreville show, you will be issued another pass for your front of line access** so you can experience Tech N9ne, front and center, when he returns to New Jersey on Thursday, July 12! *This will NOT be the full tour package performing at this make-up show. It will only be Tech N9ne and Krizz Kaliko performing at this show (plus local support), as they’re the 2 artists who didn’t get to perform their set during the original Sayreville show. **Replacement front of line passes for those who had VIP access to the original show will be available at the box office the evening of the show on 7/12. Please bring your photo ID to the box office to claim yours.